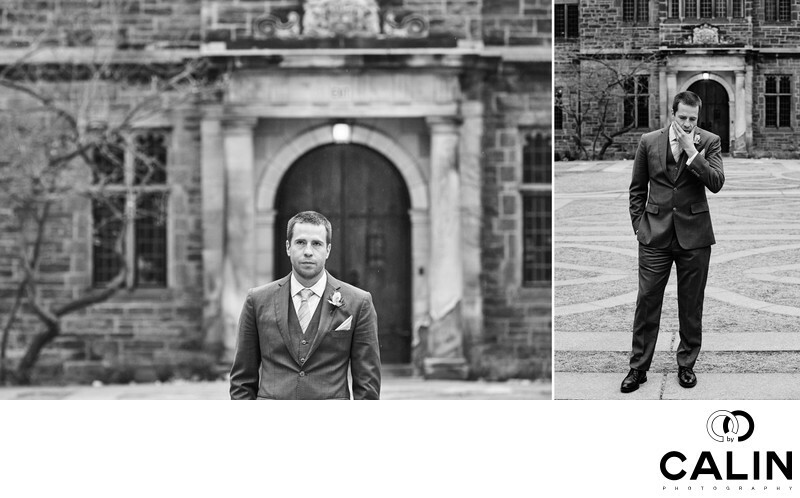 This Berkeley Church wedding album spread features the groom waiting for his bride. As wedding photographers, we often focus only on the bride as she is the main star of the show. Still, the groom is also important so this album spread is dedicated to him. I chose a black and white processing to suggest life was sad before the bride appeared. In the left photo, a relaxed groom is looking confident at the camera. Only a few minutes later, the same groom is touching his chin. That, to any body language aficionado means he has his doubts or is consumed by them and that makes the photo strong. The black and white, dark scene will completely transform in the next album spread where the bride appears in all her glory.